On Tuesday, Jan 17th, NIS America announced that they are working on Trails of Cold Steel III to be released for PlayStation 4 in North America in fall 2019. They provided very little information during the original announcement and requested that people check out their panel at PAX South on Jan 18th for more information. The panel was called JPN -> USA: Danganronpa, Touhou, and Beyond, and took place in the Falcon Theatre at PAX South at 11am. Running the panel were Travis Shrodes, marketing manager from NIS America, Moet Takahashi, translator, and Eric Budensiek, editor. Moet and Eric are also confirmed the lead translator and editor for Trails of Cold Steel III. While most of the panel was talking about the steps and basics of the localization process, the last twenty minutes of the panel were devoted to NIS America’s announcement of the game. They first started into talking about how massive the lore is for this series, and how it affects them with their translation / editing work. Eric even described it as JRPG Game of Thrones with giant robots. They pointed out that it has a larger script than Danganronpa v3, and way more voiced characters than they’ve ever encountered (over 200 characters). They explained that Cold Steel and Cold Steel II were done amazingly well and that this is now a massive amount of pressure onto them. So they’re putting in a lot of focus to understand the decisions made by [XSEED Games] with their localization of the games. Eric explained that he has studied the text of the previous two games, and has played the others of the series to be familiar with aspects of this. The important parts of working on Trails of Cold Steel III are based on the following three components, which make this release different from others they’ve worked on. Glossary: They have access to a glossary of hundreds of terms. They’re jumping into the third of a single arc, and late in the series. The glossary for this game dwarfs every other glossary they’ve used in other games, as it contains hundreds of terms. Lore: The lore for this game is extremely important. They understand how making mistakes with the lore can throw someone out of the ‘story.’ Danganronpa tends to change its rules as it needs to, whereas Cold Steel III cannot have any deviation from what’s expected. So it’s not just a matter of making sure the lore is correct, but understanding how important that lore is. Teamwork: This is where they talked about having a team to help – of course, they brought in the caveats of having more people involved. This is similar to things brought up by both Brittany (Hatsuu) and Jess, that having more people to work on translating means more work on the editor(s), and more editors can bring about an inconsistent tone in the translation. As such, a team has to work very close together to ensure as much accuracy as possible. Ryan Thomson assisted in translating the first two games with XSEED Games. Per Moet, they are asking him to do a lot of lore proofing for them, as he usually knows immediately which character or event is being talked about in vague mentions. Brittany Avery, known as @hatsuu on twitter, is involved with the project. She is involved in editing, and is a key individual in casting and recording. At this point, Moet even gets emotional at how happy she is to work with Brittany. She even says that Brittany is helping them make this the best that they can. “I hope she understands how much we love her.” Travis even adds that someone as passionate as her helps rub off on other people, as well. Moet being emotional about working with Ryan, Brittany, and Kris stood out at the panel. Finally, Kris Knigge is revealed as being a consultant on this. He is assisting with editing and keeping them on track. He’s positive and very knowledgeable about the series as well. The next topic they jumped to was based on an earlier topic about the word count of the games they had worked on in the past. Trails of Cold Steel III has approximately 1,111,111 words- which makes it 2.3x the length of all three books of the Lord of the Rings trilogy, 2.4x the length of the Witcher III, and 1.02x times the length of all seven books of the Harry Potter series. Of the project highs, they once again talk about how they understand that they have very big shoes to fill. Eric stressed that he felt that it’s an honor to be part of this. He was also excited over a trading card game being a mini game in it, referring to Vantage Master. Eric added that they want to make this game the best that they can, and that they’re taking any actions they can to see that this is done properly. Moet also added for her conclusion that it helps to physically see the people that will play the games that they work on. Of course, while this is where the panel itself ended, I managed to sit down with Travis later in the day and talk to him at length about Trails of Cold Steel III and Ys VIII. I first started by asking Travis about the timing of the announcement of Cold Steel III and how long they’ve had the game. While he couldn’t tell me the specific time they got the game, he was able to talk about the timing of the announcement in relationship to PAX South. NIS America doesn’t always have conventions on the calendar, only specifically looking towards Anime Expo every year. While Ys VIII was being worked on during an extremely busy period for NIS America, alongside Danganronpa v3 and many other titles, Travis described this situation as a ‘slow down,’ moment for them. It was also very important for them to get Sean Chiplock, the voice actor for Rean, as a “step one,” to help calm people’s fears – this was to help assure that they are planning to bring back the same talent to this game. Travis stressed that they do not want people to think that they’re looking at Trails of Cold Steel III, thinking that they can make a game that’s different from the first two already released. He said that they are trying to be the inheritors that would carry the torch of this series. 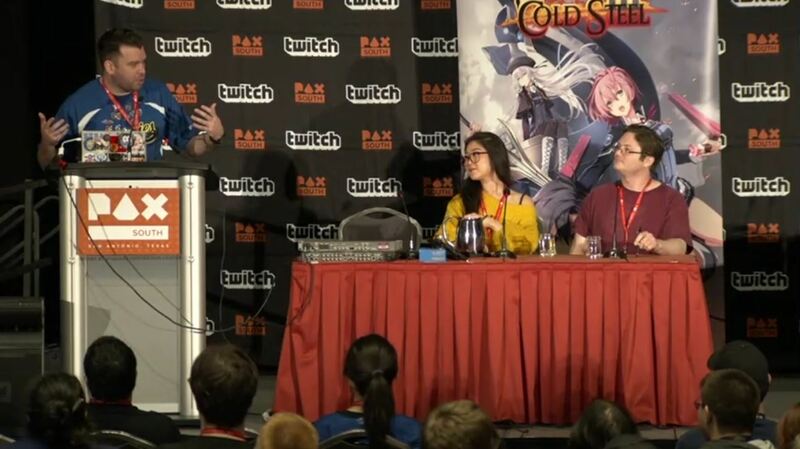 He even talked about the nerves going into the panel at PAX South, especially with how many people were wanting Trails of Cold Steel III, and how much this game has been talked about over the past year- but not only did he want to tell people about the game, but Travis wanted people to know that they intend to do it right. Regarding getting people like Ryan, Brittany, and Kris on board, this was a day one decision for them from the highest level of the company. A lot of the planning with this was trying to get people who had worked on the previous game, especially as many of them are freelance. They did not go into the planning of Cold Steel III without the constant consideration of various outcomes for this title. Most importantly, Travis stressed that this is an extremely ambitious title for them, and at a crucial time for the series, considering that this is the first PS4 developed game for the series. Additionally, not only do they want to speak to the same fans that have loved and enjoyed the series, but they want it to grow and bring more people in to Trails. While he can’t obviously talk about releases that weren’t done by NIS America, he has talked to others and told them about the other games to stress how great these titles are, especially as he played Trails in the Sky on the PSP. Additionally, while he understands and suggests playing the games in order, he has also said that no matter where people start, they are guaranteed to have a fun RPG, so for those who haven’t played the games, don’t be afraid to start where you want to start. This speaks to the strength of the writing of the series as a whole. When it comes to the announcement, Travis has said that the time period between when they obtain a title and announce it can be really short. Sometimes, they will talk to their partner and try to ‘fill a spot’ on the partner’s calendar. However, this was not the case with Cold Steel III. While Travis couldn’t say specifics on how long it was, he said that they were waiting until everything was in motion for the game, so that they wouldn’t be missing deadlines and that everything was ready and prepared. I also spoke to Travis regarding Ys VIII. While he wasn’t in a position to talk about what had happened with the title in too much detail, he did explain that Ys VIII happened during their most ambitious year ever, and that they try to ensure that games are worked on with teams internally, if at all possible. As a result, management is completely aware of the issues that had happened regarding the game, and they are seeking to ensure that nothing of the sort happens again with Cold Steel III. When asked about the current Sony policies regarding its new approval process, Travis had a number of things to say on this- but he first stressed that there is nothing in Cold Steel III that should run afoul of these new policies. He also added that they may have released titles that could be ‘targeted’ by these new policies around 2014-15, as they were a little raunchier and tended to push the boundaries more. Titles that they have been releasing lately are more contained, and they haven’t had any sort of issues regarding them. They are in constant communication with Sony who could speak up at any points during the various builds of their games. Travis also believes that Sony is, in particular, targeting certain types of titles instead of all titles in general. While it isn’t clear as to where the line is, due to Sony not having any guidelines about their new approval process, Travis doubts that any of their upcoming titles, including Trails of Cold Steel III, will have any problems with Sony regarding this process. I didn’t believe that there would be any information on DLC, since it was too early, but Travis did have information to add on this, as well, after explaining that it is a fairly late part of the localization process- if you had seen the panel in full, this comes up during the submission stages of the process. He did talk about the general process of how DLC worked- though this may not apply to the case with Trails of Cold Steel III, as it is too early to really say one way or another. As there are no big-box stores, like Best Buy, in Japan, many of these smaller chains can get exclusive DLC through Japanese developers. Sometimes, they make bylines in contracts that are so restrictive that it’s impossible for localizing publishers like NISA to get access to these contents for official release. [Editor’s Note: this is still not specific to any company they’ve worked with.] They always want every piece of DLC they can get their hands on, but sometimes things will keep their hands tied legally. Several other questions got really small answers instead of the lengthy one above. Regarding AnimeExpo, they do have plans, but they have nothing they can fully announce. However, Trails of Cold Steel III will be one of their key titles for the convention. When asked about PC or Switch, Travis said that there was no information they could provide on this, as NIS America is currently focusing on the PlayStation 4 release of the game. At the time, the only voice actor he could confirm coming back was Sean Chiplock. In this end, this was a great opportunity to sit down with Travis and talk to him at length about their current plans with the game, and it appears to have opened the door for more opportunities regarding some questions and answers in the future, so I will be sure to reach out to NIS America at later points to in order to try and continue to provide coverage for their release of this title.